The ninth day of International Hornbill Festival, 2017 witnessed cultural songs, dances and other activities performed by various cultural troupes. Highlights of the day’s cultural events themed ‘Culturally Yours’ included Unghang Asho (folk Song) by Phom Cultural Troupe, Shamyim Pe (marriage ceremony) by Konyak Cultural Troupe, ‘cultivating song’ by Chang Cultural Troupe, ‘Kiyi Arba’ by Ao Cultural Troupe, ‘Amikukula’ by Sumi Cultural Troupe, ‘Sauai Lhun’ by Kuki Cultural Troupe, ‘Zimthao’ by Khiamniungan Cultural Troupe, ‘Gogripa or Chagripa’ (wrestling) by Garo Cultural Troupe, and ‘Shakvudow’ (folk song/dance) by Pochury Cultural Troupe. During the afternoon, Zeliang Cultural Troupe presented ‘Kepie Lim’ (ape dance), Lotha Cultural Troupe presented the ‘Pani Kayi Nzan’ (folk song), Chakhesang Cultural Troupe presented the ‘Pfuheli’ and Angami Cultural Troupe performed ‘Runa Phichuneuo Kedakechule’, while Rengma Cultural Troupe performed ‘Kenyunyu’, Yimchungrü Cultural Troupe presented ‘Nimong Khekhi’ (countdown to the fixed event), Sangtam Cultural Troupe presented ‘Mongmong Festival’ and Kachari Cultural Troupe presented ‘Slemah Dikhawbani’. 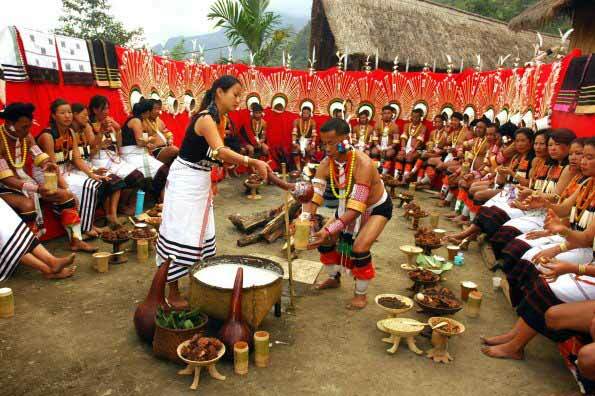 The Department of Information & Public Relations (DIPR), Nagaland, has also been organizing shows and competitions as part of the festival. DIPR assistant director, IPR, Siewatho Nyusou said Hornbill being the festival of festivals has grown in popularity not only in India but also abroad. He revealed that the inflow of tourists both from abroad and different parts of the country has been increasing with every passing year. The Department also organized International Hornbill Film Festival where short films, both local and international were screened. The department also set up its own HIPFEST 2017, wherein department’s publications are on sale and photographs of different types are displayed for public viewing.